Well, it's been quite a week. As I type this, Jack is still recovering from his week-long illness but I'm happy to say he's on solid food again! Phewf. For the first time in eight days, I could walk all three dogs together again! But that little bugger started to eat grass when we were on the trail - I have to watch him like a hawk! After THREE attempts and 16 liters of milk...(oh my gosh, my poor budget! )...I finally got some kind of Cultured Mozzarella completed. This is my Pizza Mozzarella attempt (more on Rainy Day Cheese Making). It didn't stretch...none of the three did but at least this one is more of a hard cheese than the Buffalo-style fresh Mozzarella. I have yet to try to grate it, but it's a nice consistency and I hope it'll melt nicely on our pizzas. After doing hours of research, online and on the Cheese.org forum, I decided to download this E-book. I need some answers. 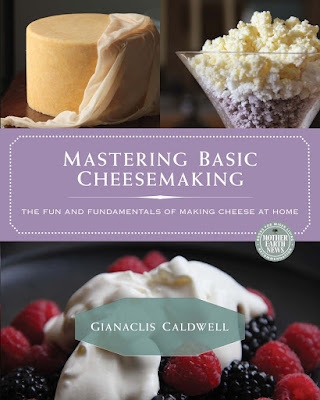 But one thing I DID find out on the forum - Mozzarella is a very finicky cheese to make and though it's called a "beginner cheese", more people than you think have trouble with it! I won't give up though. Comfort food was necessary this week - after the stress of Jack being sick and the failed cheese attempts. Each Cultured Mozzarella process was just about 8 hours. And I tried three...I followed the recipes to the word and it was very frustrating when they didn't turn out...I actually felt like quite a failure for a few days there, but I'm okay today. :) We made some pizzas the other day. Six-cheese (yes SIX!) for me (goat, Blue cheese, Parm, Cheddar, Monteray Jack and my Mozzarella); and Buffalo Turkey for Alex, he loves that spicy stuff! 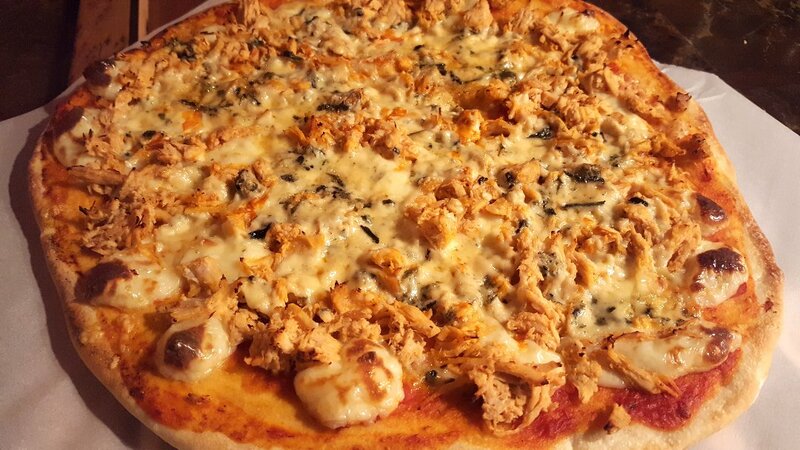 It's turkey soaked in Frank's Red Hot Sauce, with Mozzarella, a wee bit of Cheddar and Blue cheese. 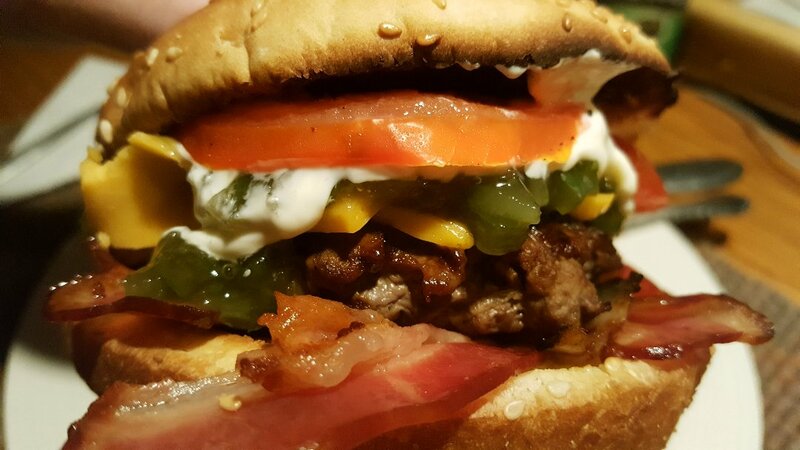 We had our scheduled burger night...but I had no appetite because it was after my first 8-hour cheese failure. 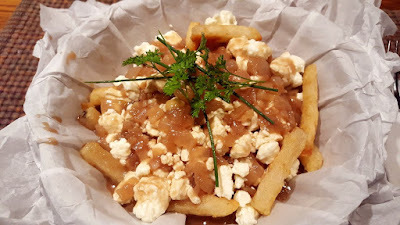 So Alex salvaged the failed Mozzarella and turned it into Curd cheese and made me a poutine with an onion gravy. It was really good! The failed Mozza made a nice squeaky Curd, go figure lol...my last attempt at Curd wasn't squeaky at all! What are these three little fur balls looking at??? Knitting on the porch...how can I knit with Charlie's big head on my lap? I thought she was just using me as a headrest, but it was really nap time and I was her pillow. Out like a light and my knitting on hold! 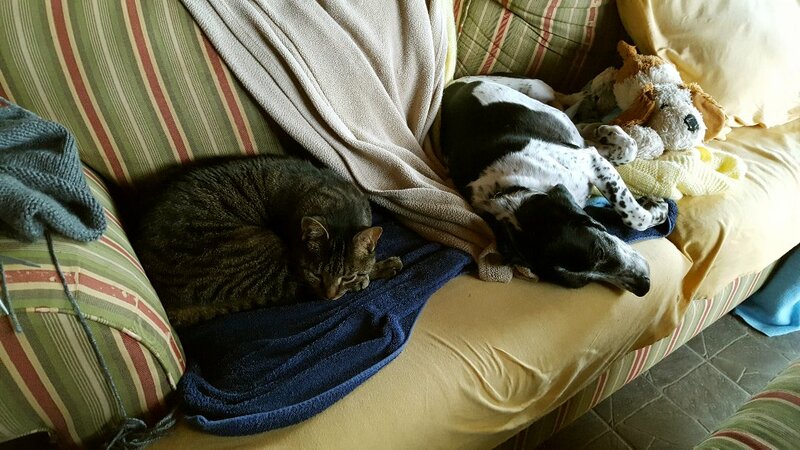 Hmmm...can't knit on the "pet couch" either...more napping! This past week seems to be a week of failures and do overs. You with cheese and me with bread. Mine finally worked so this week will be your "I did it" week. So glad Jack is doing so much better. Little stinker needs to stay away from that grass for a while. Your cover up is coming along very nicely. 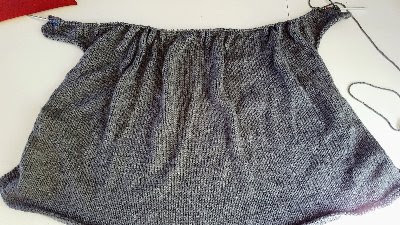 It seems to be knitting up quite quickly. 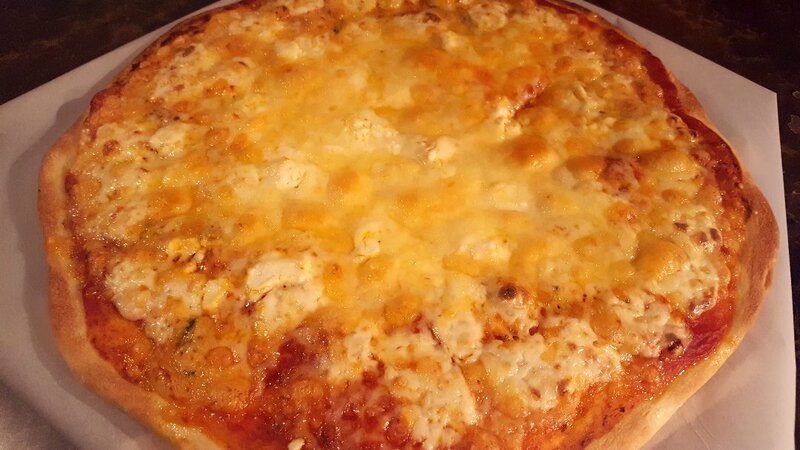 So sorry about the mozz causing problems....I had heard that too that mozzarella was the cheese to start with and that cheddar was difficult and granted the cheddar was a lot of work but you succeeded with it! Yay! You'll get it eventually as you don't give up! Just don't frustrate yourself. Glad Jack is on the mend....they usually eat grass when their stomach is upset as it helps them to regurgitate whatever is bothering them but there might have been some grass that was sprayed maybe? Is that what made him sick the first time? You're on the sleeves? Wow! that was fast as it is a lengthy cover up....good for you! Love the picture of Charlie on your lap...they adore you. Glad the mozz did not go to waste. Does Alex make the buffalo Turkey or do you buy it that way? I love Buffalo Wings but mild...not too spicy for me. Sounds like a great pizza. The bread and cheese look so good! Hi Marsha :)) Yes, you're right. You know I made the same mistake as you when I had my bread machine. I used regular yeast and the bread turned into a solid mass of heavy lol...I'm glad you found a good recipe that works though, I hope you post a photo! I have fingers crossed that this week will be an "I did it!" week too! We used to put a cage/type muzzle on Jack for walks in the woods. It wasn't tight on him at all, more like a hockey mask cage thing, but it prevented him from picking things up along the way. When we first got him, he ate everything from pine cones to grass to pieces of wood and little stones, it was frustrating. But his iron stomach always came through! Now he's not so bad, but I have a little feeling he ate a mushroom. We will never know for sure though. Hi Sam :)) I was SO discouraged after all the fails...not just the time and energy (and ego!) but my gosh nearly $35 in milk - that hurts. Mind you it wasn't a complete fail because we will use the cheeses, just not as they were intended! I have them all in the freezer. They might be good in calzones. I read a great quote: "A strong woman looks a challenge in the eye and winks"...well, I was only able to wink today lol...never give up! Jack was all over the grass eating at the beginning of last week to help him throw up but now he's just up to his usual buffet-style eating during a walk lol...I have to say every few meters, "Jack, don't touch" then he looks up at me in a guilty way! I mentioned in my response to Marsha, I think it might have been a mushroom he ate in the woods, which is a scary possibility but really he has asbestos insides, so it had to be something really toxic. At least he's recovering. I was really upset about this! Usually Alex makes the pizza with chicken, but we had leftover turkey that was cooked so he shredded it up and put it in a baggie with that hot sauce and let it sit about 2 hours before he put it on the pizza. I don't know how he can do it! I can't even look at that bottle lol. Don't be disheartened - I know that I'm not. I have every faith in you. you've been a wonderful tutor. It reminds me of that Beatles song - Something. When they started off with it, it sounded so rough. Then it all came together and it's a beautiful song now. You'll get it right just like they did. It's written in the stars. Anyway, I had hours and hours on my bass guitar and I'd be going mad. So mad that I nearly gave it up. All these years I've regretted not asking Suzanne Smith to be my girlfriend. She was gorgeous and we got on so well together but I wouldn't ask her out in case she turned me down. I've regretted it ever since. I had doubts that crept in, even though she wanted me to ask her out. Don't do what I did then and let her walk away. I can see you're having doubts but we're all with you, every step of the way urging you on. Hi Terry :)) That was such a nice comment! Thank you! :) Yes, I felt mad too...mad at the recipe, at the milk, at my thermometer lol...it's just frustrating when you think you're doing your best and it's STILL not enough. But such is cheese... ;) I'll keep trying with a vengeance! Thanks for your support! Your food always looks incredibly delicious, and those cheeses.....magnificent! Hope the pup continues on the path of healing, it's always so worrying. 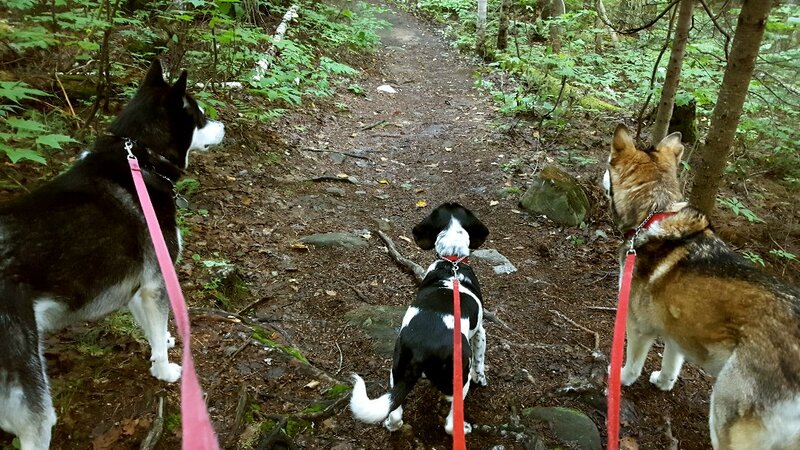 I am glad you dog is feeling better and I love the picture of the three of them on the leashes. 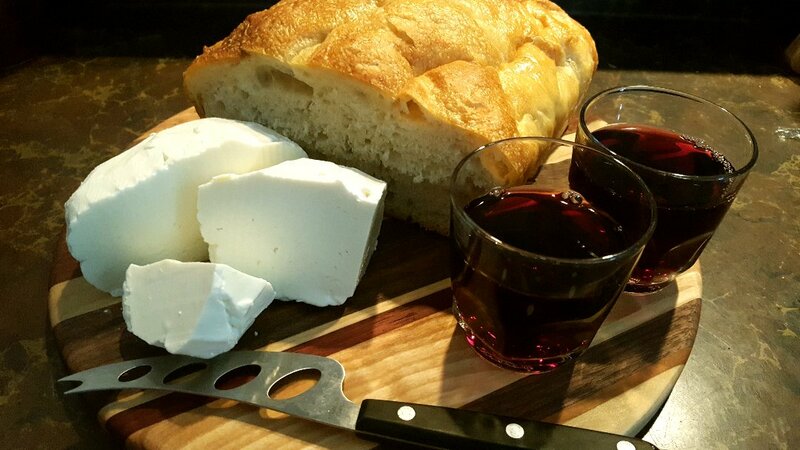 Your cheese looks yummy - bread, wine and cheese - a perfect way to recover from a hectic week. I love your determination and persistence. I think you'll be fine. Things will come together in time with all the effort you are putting in. Good stuff about Jack! I'm so happy to hear that. So much delicious comfort food at your place. Every time I visit, I feel hungry. Wonder whey? LOL ;) And so much furry love! You have some wonderful companions. Alex, too :) HAHA! Just teasing. I think you will like the cheese book. I have her book on The Farmstead Creamery Advisor and it is very well written. Ach, we all have days/weeks like this don't we? I am just so grateful to you for the detailed and wonderful information you have put out there for the cheese making. You really could do your own book! 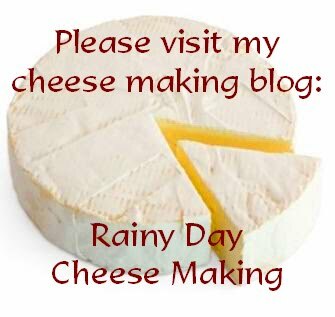 I am just hoping that I don't give up with the cheese making - I find that if things are too much of a hassle I move on. But this has been a desire of mine for a very long time so I am thinking I might just persevere. Time will tell! Good to hear Jack is back to himself....I find mine eat grass most of the time when we are out walking but it never makes them sick. I wonder if they eat it to balance themselves out? I often wonder why mine do not get sick from the grass? So strange. I am just happy he's feeling better - such a darling boy! Back when I had a microwave, I made a very successful 30 minute mozzarella. Now it is more challenging, but I think it is worth the effort. 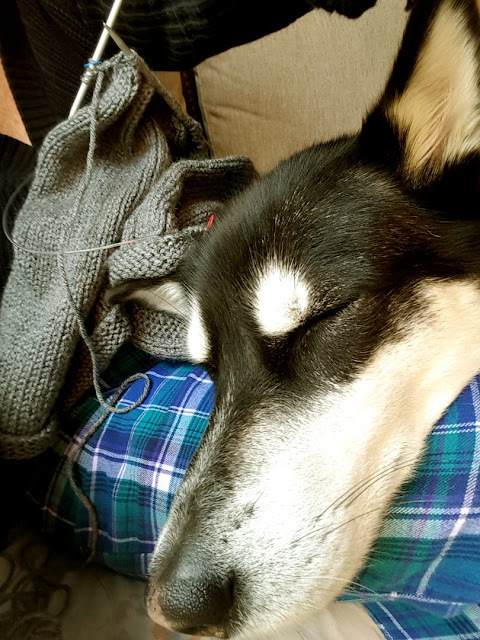 I often have to knit while a furry head is on my lap - but I am knitting socks! It's much easier to knit around those heads. You are really making progress on your cover-up! Glad to hear Jack is on the mend. Also buffalo turkey...yes please!! Don't be so hard on yourself, nothing is truly a failure if you learn from it and try again. You are a cheese-making fool! And I mean that in the most complimentary way! I so admire your enthusiasm and stick-to-it-iveness. I have no doubt you're going to be able to produce any kind of cheese you wish in time to come. Plus, you're also making great progress on your knitted cover-up. As for those pics of Charlie . . . awwwww, she loves you!!! Is squeaky good for cheese curd? I have no idea. I'm thinking you probably talked about this in a previous post and I've forgotten. I am wondering what "failed" mozzarella means. Is it usable? (It appears to be.) Does it taste like mozzarella? Basically I'm wondering what constitutes "failed cheese". Maybe you could explain in future blog post. Or maybe you already have. Or maybe there are too many ways for cheese to fail to bother explaining. lol I do admire your tenacity. And my goodness how wonderful your food pictures look! Sigh. I have made a lot of cheeses in my past, but mozz was not one of them. 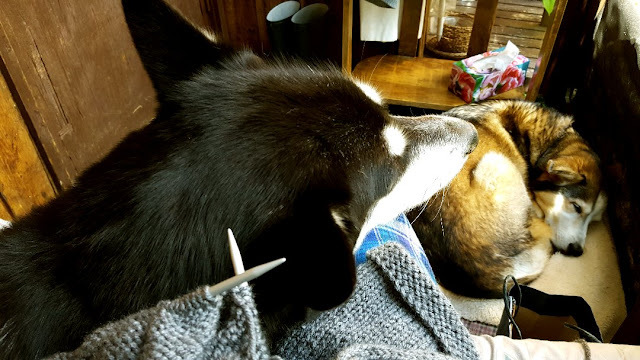 The nice part of where I crochet and knit, is it's pet free. The barn cats like to join on the porch, but I shoo them out of my lap. I finally got to crochet last night. It felt great too. 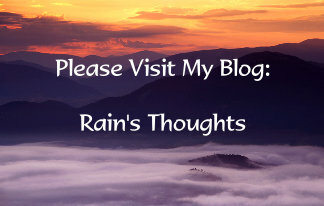 Just checking out your other blogs ~ Most interesting, Rain! that picture of the cheese, bread and wine is DEVINE!! Hi Mary-Anne :) There was a lot of comfort food last weekend! :) Things are back to normal, Jack is perfect again! I'm so glad I can walk them all together again. Hi Martha :) Lol @ wonder whey?...I'm totally overusing that all the time now hee hee...I never get tired of my own genius humour. ;) I'm relieved that Jack is back, they have such little time with us in the grand scheme...I want all the pets to enjoy every moment! I nearly gave up on the Mozza...but I've been chatting with a woman who wrote that cheese cook book...so maybe I'll be trying her recipe. Fingers crossed! Hi TB :) I've already read through it! Gianaclis wrote many books, and you're right, she does write well. Easy to understand too. I LOVE watching the pets sleep. It's the epitome of innocence for me. It touches my heart to see them because they have full trust in us to care for them and love them! I spent a long year without any dogs after my pug died...and it was miserable. I need dogs in my life :)) Btw, all three of our dogs eat grass ALL the time and it doesn't always make them throw up. They graze as they walk...I think that when their tummies are upset and they eat grass, it helps them to throw up though. When Jack was sick he was doing that...but then this morning he chowed down on the lawn and he's fine. Hi Susan :)) Do you have a recipe for your Mozza? I also love the challenge, but after 3 tries, it's tough to want to risk again. I'm just so frustrated that it won't stretch. I know I'm doing something wrong, but I have no clue what. Do you have a PH meter? I did all sorts of research and the magic number is 5.2 on the PH scale for stretching. I don't have one though. I'm wondering if they are worth the money or not. Oh and thanks! I'm really enjoying the knitting and surprisingly my hands are fine with it too! I gave up knitting a while back from sore hands, I'm so happy I can knit again, even with a big husky head on my lap lol! Hi Jenn :) You like that spicy stuff too? I can't handle it!! I've learned a few things already from the Mozza fails...and you're right. It's a learning experience. Imagine my joy when I finally can stretch the cheese??? I'll be taking loads of photos and using lots of exclamation marks lol!!!!! Hi Nancy :) I've managed to learn to do lots of things with dog heads on my lap lol...I used to have 2 pugs and I'd always have one head on each leg, I got creative! :) If I didn't love cheese so much, I think last week would have been the end of that for me, but I really am determined to make that pizza Mozza...the stuff in the store just isn't good enough anymore! 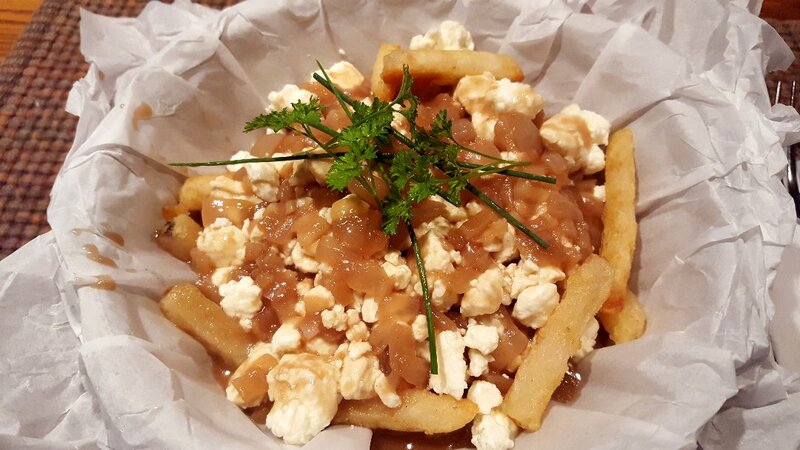 Hi Becki :) Squeaky curd is great because it melts better and has a greater chewiness which is what we strive for in the poutine cheese! There is some science behind it for flavour too...same as Mozzarella. It has a completely different consistency, taste and texture when it doesn't stretch. When I make my next Mozza, I'll write more about that, thanks for the suggestion! But we can still eat those Mozzarellas, they are cheese, just not the result I was hoping for, but they don't melt so they can't really be used for cooking. We're using them up in salads and as snacks right now. Hi Kristina :) Nice to see your comment! :) Oh my...a pet-free zone, is that even possible??? 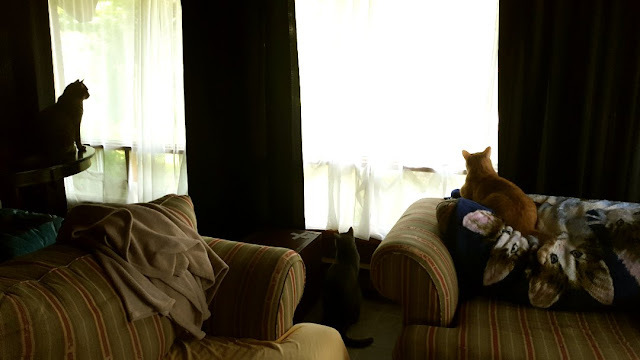 Alex and I talked about making our living room pet-free...didn't happen, then our bedroom, nope...we can't kick them out of any room! :) I'm so glad you got to your crochet! I'd love to try that poutine! And cute cat. The cheese and bread looks delicious and so does the pizza ... and Charlie of course ... she is so cute !!! And what a good looking cat. Warm greetings to you! Thanks Guillaume :) I wonder if you can get good poutine where you live now. Thanks Blogoratti :)) Any cheese is good cheese to me, but I really wanted to make a nice melty pizaa Mozza! I'll try again tomorrow!